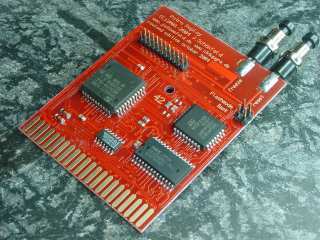 This clone of the legendary "Action Replay" cartridge has been developed together with members of the active C64 scene. We're proud to present new hardware for the Commodore 64 in the 21st century! Turbo Assembler Makro in the flash (huge updates coming soon)! Gold plated contacts, mainboard in flashing red! The software is frequently updated by freeware programmers. Patches for the most popular terminal programs Novaterm and Desterm are already available, so a Silversurfer that is connected to the Retro Replay can be used. See also: MMC64 (MMC/SD card reader), RR-Net (Ethernet expansion for Retro Replay and MMC64), cartridge case (available in several colours).